Our AGM was considered a success by the board and those members and guests who attended. Our guest speaker was RBC Olympian Jill Officer of the Jennifer Jones curling team and she gave a very touching and motivational speech. The new Board of Directors was elected and sworn in at their first meeting in February. Scott Dyke, Ashley Monka, Troy Mutch and Marvin Beaumont are the table officers and directors are; Ryan McLaughlin, Clinton Davie, Marilyn Crewe, Trisha Phinney, Cindy Hockin, Jeff Braun, Mitch Hutton, Tammy Wilson and Don Dufort. 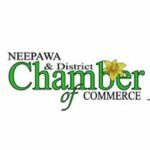 They are already hard at work on planning the Third Neepawa & District Chamber of Commerce Annual Fair. It will be bigger and better this year with plans to include a parade! Keep and eye on this blog and our facebook page for details as they are finalized.